Players are always asking how to hit the ball further, most common question in golf instruction. When we take a look at PGA Tour and LPGA Tour players we can see some very obvious areas that assist these players make a powerful golf swing look simple and efficient. This article will cover some myths and facts about power and how to create club head speed, that don’t require a fitness trainer. Just if anyone is wondering, my first preference would be to absolutely work on full body flexibility, stability, and strength, but there techniques to create distance with your irons. Since, everyone is in good shape and fitness is not be the issue let’s talk about where we can gain some club head speed and possibly where we can alter areas of the swing that may create club head speed. This list is not all inclusive, but they are listed in order of priority of what I look for in a golf swing when a player wants to pick up yardage. Pivot and turn is one of the largest creators of power in the golf swing, but few players do this correctly. When an instructor mentions the word pivot, I am not sure what is going on in the players mind, but I can get some pretty blank stares. Jim McLean in the late 90’s published a book called the X Factor where he was talking about creating a separation of angles in your shoulders and lower body, this is close to what we are talking about. Notice in the image below that Jim is creating torque between his lower body and upper body, but also he is creating the proper pivot position. Notice his right hip and how he is almost sitting down with his right hip. This is what the position looks like, but most player have no hip rotation and only hip lateral movement away from the target. When a player can create this position they can create more club head speed on the downswing due to the ease of creating the correct sequence on the downswing, simply meaning they can use their lower body first and not their upper body. Width can be defined as different things during the golf swing, but I feel that something Jimmy Ballard said long ago is very true about width. 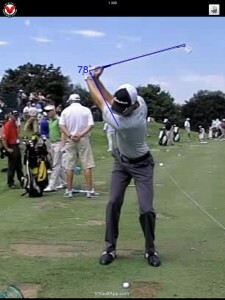 When defining width in the swing the player should think more of the club head and not their hands. A common question in players is “should my lead arm be straight?” and 9 times out of 10 this is how the player defines width. I would argue that the larger percentage of players’ lack of width comes from over hinging of the wrist at the top of the back swing and some do have a bent lead arm. This is not a statement of fact in all great golf swing, but what I have noticed when I study the golf swing is that most PGA Tour players with iron shots will have between 90 and 75 degrees of wrist hinge and with drivers it may be as little as 75 to 60 degrees, but not to often does it dip below this point. Notice in the following image of Sean O’Hair that, yes his arm is straight at the top of the backswing, but also notice that Sean has also only set his wrist to 78 degrees of angle. This allows him to keep proper width to his swing and when you have a larger arc produced by proper width you create more club head speed. Think of it this way, would you like to create power with a large circle or a small circle, your choice because on the downswing the arc is only going to get small, I hope. This may sound like an obvious place to start, but you might be surprised just how this small angle can make a larger difference for many level of players. Squaring the clubface can be achieved many different ways, but we are talking about why this should be a goal for everyone’s golf swing. If the club face is 2 degree open that can be as much as 8 yards lost because of two factors, one added side spin and two added trajectory. 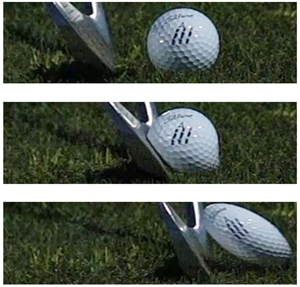 Notice in the image below how the golf ball is compressed with an iron. Just as you can imagine if you where to hit the top half of the baseball during a baseball ball game you can since the lose of energy in the contact and also lose in trajectory. This lose in transfer of energy and trajectory is the same thing happening when players have slightly closed or open club face at impact. Squaring the club face can be as simple as proper grip, alignment or even staying behind the ball longer through impact. These are just a few of the places I look for in average golfers to add distance with their irons. This was not a in-depth discussion of how to create power just some areas to double check and make sure some of the little things are working correctly. Please contact me with any questions you may have about theses areas of the golf swing and if they pertain to your golf game.